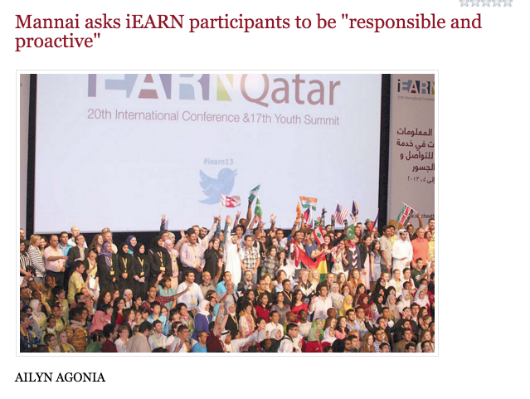 "BE responsible, proactive citizens and help find solutions to the challenges brought about by the changing world, Reach Out to Asia (ROTA) Executive Director Essa al Mannai reminded the delegates at the closing ceremony of the iEARN (International Education and Resource Network) 20th International Conference & 17th Youth Summit in Doha on Friday. The global event which explored the year"s theme of using technologies in education to reach out, learn and build a better world concluded on a high note at the Qatar National Convention Centre." Read the full article on Qatar Tribune.